We all have a collection of photos that are not the quality that we would want to print. Still we can't quite throw them away either. When I have the time I like to play around with them adding filters and other PS plug-ins. You might be pleasantly surprised when a nice image emerges from playing around. I am sharing some of the images I came up with to help you get your creative juices flowing. If you enjoy this kind of thing, I hope these examples will stimulate your mind. 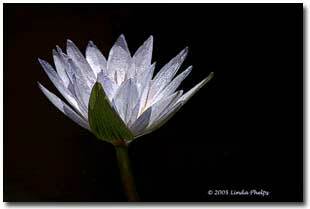 Here is a rather mundane photo of a water lily that I took last year in a small park in Austin, TX. The first thing I did was to remove the little bee on one of the upper petals. Then I experimented with the PS plug-in Picture Man Rubber. 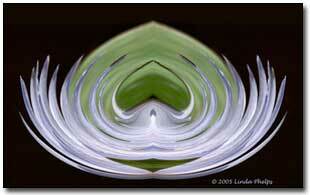 The swirl filter was used to create this abstract looking image. When I opened the filter I tried out several ways to use the swirl. The clockwise movement seemed to look more natural than the counter clockwise did. 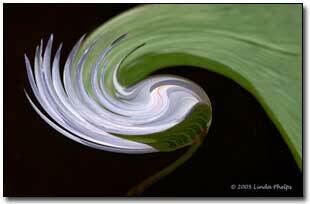 The half turn of the swirl left the lily petals in a pleasing shape. The stem was straightened out and some cropping was done on the top and down the right side. There were just a few places that needed a little touching up. Then I moved on to using the mirrors in Visual Manipulation. The plug in has adjustments so you can slide the mirror effect back and forth until you find the place you like the best. A heart appeared when the two images where place side by side. This seemed like a nice idea, so I lengthen the petals on the inside until they met in the middle. When the image was flipped to see the cool look of the heart. Yek! There was no heart. It was replaced by a scary spider type of bug! Therefore it is still in the original format that came about after using the mirror filter. The vertical mirror ended up looking like a pineapple and that one was left in the computer. Take a look and see what you think. 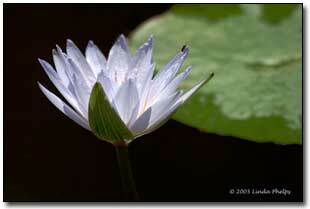 Now I went back to the original photo and removed the green lily bad. To do this operation I used the eye dropped in PS7 to sample the background. Then I chose a sharp brush and painted out the leaf. The sharp brush worked well when going around the petals in the back part of the flower. The edge took off some faintly blurred edges. I decided not to crop off the large black area until I finished another variation of the photo. 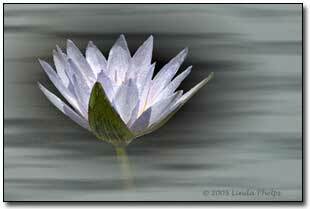 For the next image I used the PS7 water color filter to add a more delicate look to the water lily. This time I opened Auto FX Mystical Lighting to use some of the wonderful filters in the program. Each of the filters have two more adjustments you can apply to the filter before adding it to the image you are working on in the program. There is no end to the combinations that can be done in this program. If you find an application that you like and would want to use again, you can save the action using that filter. It will be ready to use the next time you want to add it to another photo. I chose the Mist Filter. There are a number of sliders for this filter and the settings produced a really different image from the original capture. This last image was produced by simply adding poster edges using a fine line. It is so simple and really cool to look at. It has been fun visiting with you. I hope you will be interested in doing some experimenting on your own as you will find nice surprises when trying new filters. You will have the fun of letting your fingers on the computer keys take your humm... drum photographs to a new level.